Aortic dissection is a serious condition and may be fatal if not treated early. The aorta is the body’s main artery, which branches off the heart and descends in the thorax and into the abdomen. A dissection of the aorta occurs when a tear develops within its wall. The wall consists of three layers and this tear allows blood to flow in between the inner and middle layers, causing them to separate (dissect). Aortic dissections are classified into two types: type B dissection involves a tear in the descending part of the aorta and may extend into the abdomen, whereas type A dissection develops in the ascending part of the aorta just as it branches off the heart. Men in their 60s and 70s are most at risk. The most important risk factor is increased blood pressure as this result in greater stress against the aortic wall. Other risk factors include atherosclerosis, smoking, pre-existing aneurysm, aortic valve defects and previous surgery on the aorta. A number of genetic disorders, such as Marfan’s syndrome, also predispose the aorta to dissect. Traumatic chest injury may also cause dissection. Sudden onset of a severe, tearing pain in the back is the most common presentation. Other symptoms include sweating, shortness of breath and even loss of consciousness. These symptoms are similar to those experienced during a heart attack. Early investigations and diagnosis are critical in distinguishing between the two conditions, which require very different treatments. The most serious complication is rupture of the aorta, which causes internal bleeding and often leads to death. In addition, the build-up of blood in the wall of the aorta can disrupt normal blood flow down the thorax and abdomen. This can compromise blood supply to organs such as the kidney and intestines. Medical management is usually preferred to surgical management for type B dissection in the absence of complications. This usually involves medications that decrease blood pressure and heart rate. 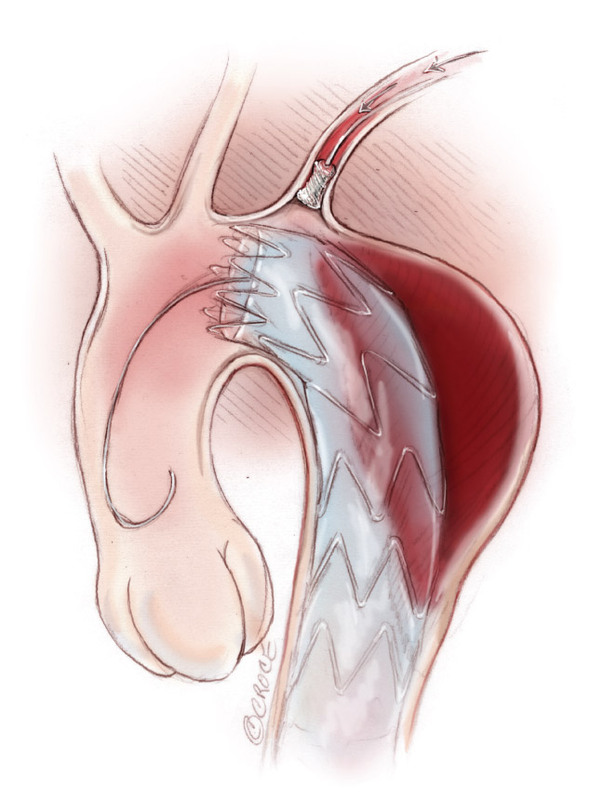 By minimizing stress on the wall of the aorta, the dissection is less likely to worsen over time. Blood pressure lowering medication may need to be life-long in addition to regular CT or MRI scans to monitor any changes. If the aorta ruptures or if severe complications develop, intervention is indicated. The preferred treatment is represented by the insertion of a stent. This small wire tube is inserted through a peripheral blood vessel, and serves to keep the aorta open and seal off blood entry into the dissected wall. In those cases that cannot be managed using such a minimally invasive approach, open surgical reconstruction of the aorta is performed. Surgery often involves removing as much dissected aorta as possible, blocking blood flow into the wall and replacing the damaged aortic segment with a synthetic graft. Prevention of type B dissection centers mainly on blood pressure control. In the case of pre-existing aneurysms and predisposing genetic conditions, regular monitoring is necessary.